This year the event spreads over the entire weekend, with performances at multiple stages on Friday evening, Saturday and Sunday. On the off-chance you haven't already heard, this weekend marks the sixth annual Supercrawl music, arts and fashion festival in downtown Hamilton that grew out of the monthly James North Art Crawls. Supercrawl started on a cold, drizzly Friday evening in 2009 and has grown remarkably since then. It drew 20,000 people in 2010, 50,000 people in 2011, 70,000 people in 2012 and a cool 100,000 people last year. It is also spreading over a larger part of the city, with its borders extended west to MacNab Street and east to Hughson Street, and also including Gore Park and King William to John Street. James North is closed to traffic opened to people from King Street to Murray Street, a block north of Barton. You can consult the Supercrawl Map to see a list of venues, restaurants, facilities, art installations, nearby parking and so on. Friday night's headliner is hometown hero The Arkells, who play the Hamilton International Airport stage at 11:00 PM following performances by The Strangers and The Dirty Nil. 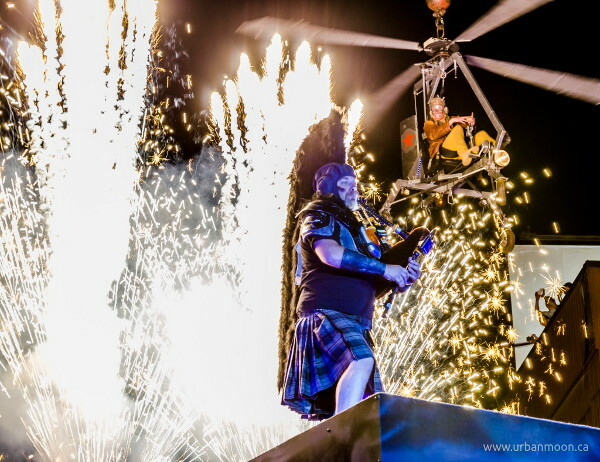 On Saturday evening, the awesome Circus Orange will be back with another bombastic, superlative-laden performance of physicality and pyrotechnics. GO Transit has a special Supercrawl schedule for people coming into town. In addition to frequent buses, GO trains on the Lakeshore West line will run every 30 minutes with bus connections between Aldershot and Hamilton GO Centre. Special trains will depart Hamilton GO Centre on Friday and Saturday night after the last concert performance. Of course, if you're coming from closer, you can always take the new Cannon Street Cycle Track, which officially opened at noon today. Circus Orange Event Area at James and Wilson.